InfoComm hosted its BIG Night on June 18, dazzling a multitude of attendees who gathered to see several live performers and experience the excitement of the annual awards presentation. The festivities included a Battle of the AV Industry Bands, and awards given out by Systems Contractor News, Rental & Staging Systems, Lighting & Sound America, and ARCHI-TECH. 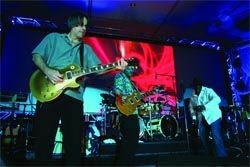 Attendees to InfoComm's BIG Night were treated to a Battle of the AV Industry Bands and an awards presentation presided over by InfoComm's executive director Randal A. Lemke, Ph.D. (inset). This year's format was more casual, allowing for more mingling. "Attendees had been asking for a networking environment, so we decided to put that together," explained InfoComm executive director, Randal A. Lemke, Ph.D. "Also, the event gives attendees the chance to see high-end equipment being used in production, which a lot of the rental and staging companies can bring clients to see. Plus, the gear will remain set up for demos as well." The BIG Night was host to a multitude of awards, including three from InfoComm itself. The Distinguished Achievement Award went to Scott Miler, chairman and CEO of ATERAS. Prior to that, he was chairman and CEO of AMX, the company that he founded in 1982. He left AMX in 1998 but rejoined in 2001 as a turnaround strategist. He rebuilt the compny and in the spring of 2005 sold his interest when the company was taken public. Awarded InfoComm's Harold Thiel Volunteer of the Year Award was Ernie Bailey, CTS. For more than 20 years, Bailey has been a contributor to the audiovisual industry and the association. He has 26 years of industry experience, attending InfoComm (formerly NAVA) 23 times, and holding membership status for 22 years, often serving on councils and committees. He also maintains his CTS credential, has participated in each Fall Leadership Forum, and was elected Chair of the Technology Managers Council in 2006. Paul Depperschmidt, CTS, director of AV integration channels at Polycom, was named Educator of the Year. He served many years as chair of the InfoComm Conference Subcommittee of the Professional Education and Training Committee, during which time he launched the "Super Tuesday" programs and facilitated its Technology Trends program.He was also instrumental in expanding the InfoComm Conference program to over 7,000 registrants in 2006. He currently serves on the PETC Steering Committee.